Visitor Recordings - A.Y. Technologies Inc. Visitor recording tools are powerful software that can help you learn about your user and improve your sites performance. Tools like Lucky Orange, Inspectlet, Hotjar, Clicktale, Smartlook, and Hoverowl are relatively new services that take user experience, analytics and analysis to a whole new level, granting you access to how people engage with your content while on your site. These tools offer the ability to skip pauses and play 2 or 4 times fast but watching engaged experiences at regular speed can be insightful as well. It grants access to what that person is seeing and doing in real time. As behavioural observation it can feel a bit voyeuristic. Watching recordings sometimes makes me laugh, other times confused, and often I learn things I would otherwise have missed. Visitor recordings create empathy like never before. You can tell what someone is reading as they read it and as they search for what they need. Initially, these observation techniques feel like peeping through a keyhole. How much you can glean from watching someone navigate and process in real time is surprising. Like watching a story unfold, you witness the discovery processes and how people learn, engage, fail, explore, reach dead ends, get bored, and ultimately leave. You can see what catches the eye, the length of time it takes to digest information, and what sections users scroll past due to disinterest. What can you learn from Visitor Recording Tools? How easy is it for people to find what they’re looking for? You can tell by how they explore your site. Are the bouncing from page to page, or do they arrive at their destination quickly, achieve what they want/need to do and leave? Depending on the kind of site and content you have these desired outcomes and results will be quite different. We learn a lot by seeing where our visitors always seem to go first, and which key pages they tend to move between. This tells us what our users are really interested in from our site, and what to invest time into for making that experience even better for them. The way people explore the internet is (perhaps unsurprisingly) a nonlinear and rather meandering path and users can easily be distracted from their goals. 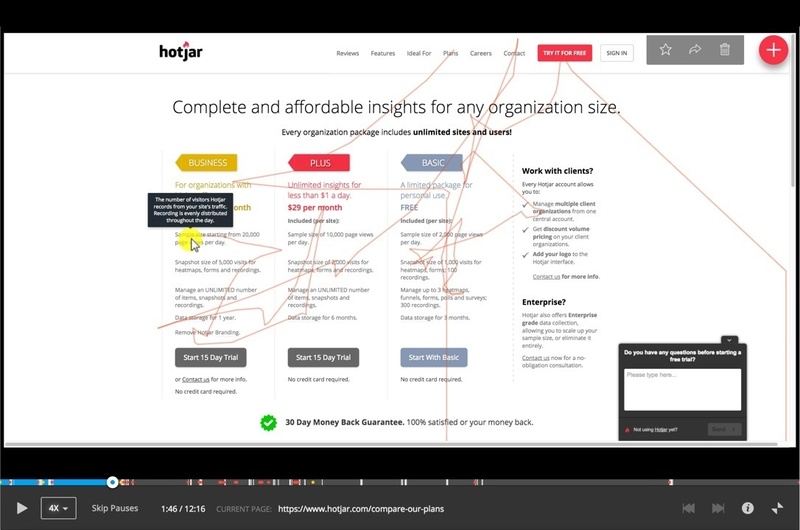 It offers a glimpse into where your users might be derailed from performing a certain action. Not to mention, problem solving, learning and discovering methods of others (heuristics). One of the unexpected revelations is just how often people click on things. Users click everywhere and anywhere, whether it appears to be a link or not. We’ve learned where links ought to be as a result of where visitor recordings and maps have tracked clicks. The same can be said for images that are unclickable that should be enlarged or expanded on clicks. Visitor recording tools will often show you the average fold position and the information the majority of your users will see immediately when landing on a webpage. If your most sought after information and clicks are below the fold line, consider moving them upward to be more readily accessible. The dark horse of visitor recordings is by far the cursor. We give away more than we know by the absent minded way we move that little black arrow. Watching the pointer travel around the page, hover over buttons and links, and follow along text as it’s being read, I am often able to get a very good idea what someone is reading and processing based on the cursor. The benefit is knowing what content is read most frequently and with the most care, in comparison to other content that is rushed past. If you give one of these services a try, trust that you will find moments of insight, bursts of humour and a greater understanding of your users needs. Websites are changing every day based on this data, and it means that all this behavioural visibility is improving the Internet one day at a time. The internet itself is becoming a more efficient place where the things we’re looking for are more readily apparent and accessible. In short, the internet is being tailored to us. Right now.